Africa is one of the continents of the world known for being richly blessed with most of the precious natural resources that can be used to produce spectacular art works and architectural edifices. But for some decades in the past, Africa has not always ranked in the list whenever it comes to expensive structures, Africa has always been considered one of the continents with the most underdeveloped countries. But thanks to modern technology and civilisation, which has helped Africa to put into action what she originally had in the best and finest ways. Today, Africa can boast of innumerable technological outfits and buildings that can stand in competition with other enviable parts of the world both in beauty and cost. Check out these 15 magnificent and most expensive buildings in Africa that speak wealth, fortune and extravagant affluence. The Southern Sun Waterfront Hotel in Cape Town consists of 546 well-appointed rooms on 14 floors. Southern Sun Waterfront Cape Town is situated in the heart of the city’s most sought-after areas. Business travellers have the advantage of being minutes away from the Cape Town International Conference Centre and other major corporate hubs, while leisure travellers are right in the midst of the city’s most popular landmarks. The South Sun Waterfront building is the least expensive in this list but I must confess that it is beautiful. However, I do not think $23 million is anything but expensive. The Old mutual centre is found at 303 West Street 4001. Durban. South Africa. It is a postmodern High-rise building of 33 floors above the ground, covering a land area of 32,000 metre square. The building includes 27 889 m² of A-grade office space, 2 348m² of ground floor shops, and an adjacent four-storey parking garage. One Merchant Place is a magnificent postmodern architectural edifice of 20 floors, covering a land building area of 28 000 metre square. It is an 84-metre high-rise building. It is located in Bute Road, Sandton city, in South Africa. The developer is the Rand Merchant Bank and the contract was chiefly handled by the Grinaker-LTA. With 26 floors, the building is 113.70 metres above the ground and covers a land area of 24, 500-metre square. 88 on Field is located at 88 Field Street or 362 West Street (2 entrances) 4000 Durban South Africa. It is a gigantic structure which captivates the attention of the eyes at a glance. It is not just great in outlook, it’s also mighty in quality, having cost as much as $40 million dollars to construct. It is one of the notable skyscrapers in South Africa. This is an exclusively expensive and unique hotel located at Newabaa – Taba Rd, Taba, South Sinai 46621, Egypt. The hotel boasts a unique position just 10 kilometres from Eilat, overlooking three countries—Jordan, Israel, and Saudi Arabia. It is painted in sparkling white which gives it a stunning outlook. It is a low-rise building consisting of a total of 14 floors. An inside look at this building will surely leave the viewer in no doubt about why it made it to the list of the most expensive buildings in Africa. It is really rare in its kind. The Department of Taxes and Attorney General’s Chambers Building is currently the tallest building in Botswana with the height of 176.77 ft (53.88 m). It took 7 years and $42 million to complete and is one of the most expensive buildings in Africa. The building, located in the Government Enclave on Nelson Mandela Drive in Gaborone, is home to the Botswana Department of Taxes and the Attorney General’s Chambers. It is 47 metres high with 13 floors above the ground and 2 floors below, giving a total of 15 floors. It is a very fine and beautiful outfit, spectacular, as well as expensive. Maison des députés is a 7-storey low-rise but unique and expensive building. The interior speaks much more of the fortune lavished in this fine construction than the exterior. Having taken $50 million to be put in place, it is ranked with the most expensive buildings in Africa. Hilton Durban is a five-star landmark hotel in Durban which offers deluxe accommodation. It is next to the Durban International Convention Centre. All guest rooms offer luxury amenities and easy access to Durban’s beaches and central business district. Just have a look at the photo above, it is spectacular, isn’t it? Hilton Durban is a modern pile foundation high-rise building consisting of 21 floors with 19 above the ground and 2 below, (76 metres high). It features a lot of the most expensive furniture and fixtures which characterises modern architectural buildings. The Michelangelo Towers is one of five Legacy Developments that is in the heart of the Richest Square Mile. The Towers, linked directly to Sandton Convention Centre, caters to guests’ every possible need and is the ultimate exclusive hotel for an amazing business and lifestyle experience. The Michelangelo offers 242 suites and rooms – with ensuite amenities – as well as world-class facilities in a stylish and elegant setting. It is one of South Africa’s elite hotels, having accommodated guests such as Oprah Winfrey, Gayle King, Mariah Carey, J-Cole, Kanye West, Lady Gaga, Adam Lambert, Justin Bieber, Michelle Obama, and most recently United States President Barack Obama, etc. One needs not be told at the very sight of the Michelangelo towers that great fortune was spent in the construction. It comprises 34 floors which gave it an intimidating height of 140 metres. The West Hills Mall is located at Dukonah, near Weija, along the Accra-Cape coast highway in the Greater Accra region of Ghana. The Mall which took a whopping $93 million to build is jointly owned by Delico Property Developments, Social Security and National Insurance Trust. The 23 acre West Hill Mall which was constructed by South-African real estate contractors, is to house 67 local shops, 65 line shops from Ghana and around the world, international shops, and two major tenants, Shoprite and Palace Supermarket. One of the most interesting features of West Hills Mall is its massive entertainment and recreational gallery, which has a special square for open-air concerts and theatrical shows with a sitting capacity for 1,500 people. It is currently the most expensive shopping mall in West Africa. The Umhlanga Peals with all its extravagance is an artistic & structural masterpiece. It is a luxury self-catering apartment within the most exclusive location on Umhlanga’s golden coast. The exact address of this rare outfit is 6 Lagoon Drive, Umhlanga 4319, KwaZulu-Natal, South Africa. The Pearls of Umhlanga is a spectacular residential resort offering choice luxury apartments, duplexes and penthouses. Just a look at this wonderful design brings about a breath of comfort, relaxation and affluence. Well, it didn’t just come about, millions of dollars made it possible – $138 million! Portside is a 139-metre spectacular skyscraper located at No. 5 Buitengracht Street, Hans Strijdom Avenue, Cape Town, South Africa. Its construction started in 2001 and was completed in 2014. It is the city’s tallest building and as well Cape Town’s first significant skyscraper developed in the central business district (CBD) in 15 years. The building is jointly owned by FirstRand Bank and Old Mutual. The bank will self-occupy while Old Mutual will be renting office space to premium customers. The building comprises 32 floors and has an accommodation capacity for 3000 people. One of the things that makes it magnificent is the fact that it is completely and uniquely covered with blue glass. The Corinthia Hotel Tripoli, originally known as the Corinthia Bab Africa Hotel, is a five-star skyscraper hotel in Tripoli, Libya. It is located in the city centre, near the central business district. It is run by the Maltese Corinthia Hotels International. The hotel was opened in 2003 by Prime Minister, Shukri Ghanem. It is considered the most expensive luxury hotel in Africa. 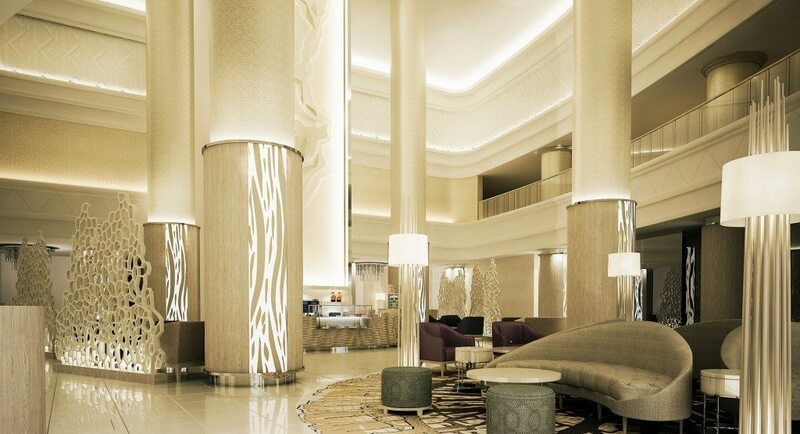 The Corinthia Hotel speaks wealth, affluence, luxury, extravagance, name them. It oozes comfort, pleasure, and relaxation. With 28 floors, the building towers 100.48 metres above the ground. 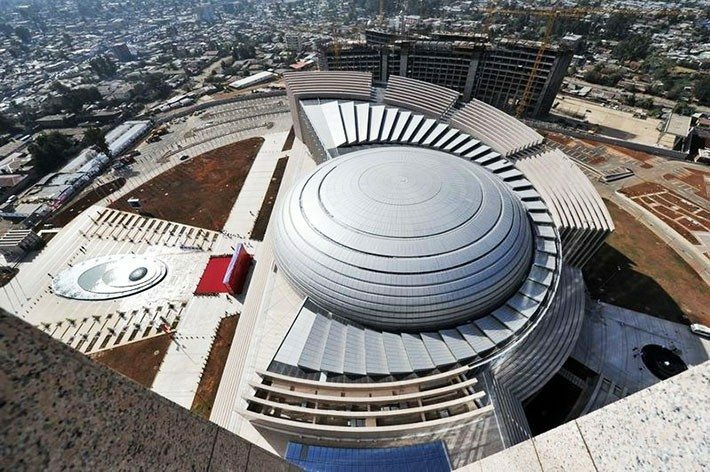 The AU Conference Center and Office Complex is a building in Addis Ababa, Ethiopia. It is the headquarters of the African Union. The main building is 99.9 meters tall comprising 20 floors, making it the tallest building in Addis Ababa. The construction of the building which took a whopping $200 million was funded by the Chinese government as a means of promoting international relations between the two countries. It is the second most expensive building in Africa according to records. The Bibliotheca Alexandrina is the largest library in the world. It is located along the coasts of the Mediterranean sea in Alexandria, Egypt. This magnificent architectural edifice looks like a wedge-like disc, with eleven cascading levels. In addition to the library facilities, the library also contains other cultural and educational functions including a planetarium, several museums, a school for information science, and conservation facilities. The building spans 160 meters in diameter and reaches up to 32 meters in height, while also diving some 12 meters into the ground. The library contains shelves designed to accommodate about 8 million books, with the main reading room covering 70,000 m². Bibliotheca Alexandria is currently recorded as the most expensive building in Africa. It’s really a sight to behold, millions of United States dollars speaking!